As I sit here, waiting in anticipation of the coming blizzard, I start thinking of some fun projects to do with my daughter. Though my daughter is now 14 years old, I think these fun crafts are great for any age. And best of all, they can be done with most items that are probably already in your home. Take three large marshmallows and push them through one end of a pretzel stick. Give the snowman eyes by “gluing” on raisins or mini chocolate chips with the frosting. Decorate the rest of your snowman with M&M’s or any other small food décor items you may have in your home. Let your imagination guide you. Top your snowmen off with adorable hats using either peanut butter cups or chocolate kisses. Blend equal amounts of shaving cream and glue for each color of paint you want to make. Next, add 1 or 2 drops of your desired choice of food coloring and mix with a craft stick or toothpick. A good idea is to use an old ice cube tray to make a myriad of different colors. Be creative and mix different colors to come up with unique shades. When you are done, let the paint set for 2 minutes. Next, paint away! To start, take a balloon and cut up the side lengthwise. Next, stretch the balloon over the lightbulb part of a flashlight. Then, secure the balloon in place with a rubber band. The more you stretch the balloon over the flashlight, the thinner it will become, making a lighter and brighter color beam. Now, have your light show! Go into a dark room that has a lot of wall space and aim your colored flashlights at the walls and have a fascinating light show. This also makes for great entertainment at sleepovers. To start, mix 1/4 cup of cornstarch with 1 cup of warm water and food coloring; use as much food coloring as you need to get the desired shade you are looking for. Next, take the sprayer part of your spray bottle off and put your funnel over the opening of the bottle. Pour the paint into your spray bottle. If you don’t have a funnel, mix your paint in a container that has a spout, such a measuring cup, to easily pour your paint into the spray bottle. Now, go on out and spray away! Just make sure to only spray on your own property. To prevent clogging, shake your spray bottle frequently. Who says the best things in life aren't free? For little ones with a creative spirit, acting on the stage is a dream come true. Bring their creative spirit to life with and encourage them in imaginative play with a theater of their own. Your budding actors and actresses will find everything they need to put on a full-scale production with the Super Star Theater from Lisa LeLeu. The stage is made of durable, easy-to-clean polyester fabric with a sturdy fiberglass frame; the theater is easy to assemble and can be rolled up compactly for convenient storage. The Super Star Theater offers endless opportunities for the soaring imagination. Why not turn the theater into a real family production? Help your kids to write their own play, choose the actors for each part, and let them design costumes. Invite friends and family to opening night and serve real snacks while the audience takes in the show. You may even decide to film the production with your digital camera and create a real movie that your kids can watch over and over. 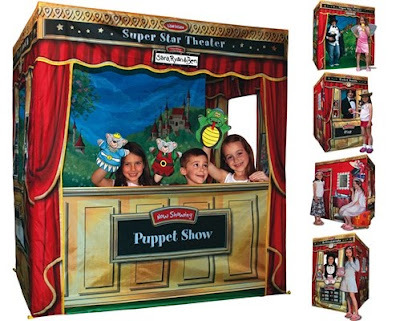 The Super Star Theater is also perfect for a day care or preschool setting – explore the arts and teach young children to express themselves, whether they are acting out a role themselves or staging a puppet show. You can order the Lisa LeLeu Super Star Theater online today at A Kid Place for immediate shipping, just in time to put on a holiday production that your whole family will love. Check out our site for hundreds of fantastic kids’ items that are sure to make this holiday season the best ever.